The rare 1867 "Base Ball Polka" sheet music. Robert Edward Auctions says its one of the rarest items of its kind; The Base Ball Polka sheet music, composed in 1867 by James M. Goodman. The auction house contends that in their forty years of dealing in baseball artifacts its the first one they’ve ever handled. 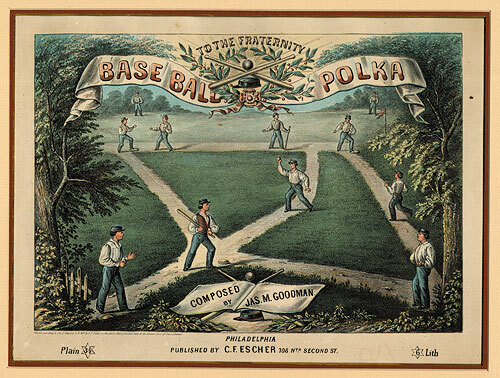 It’s clear that not many copies of the Base Ball Polka are known to have survived since the musical score was first published by C. F. Escher of Philadelphia in 1867. In 1983, John Thorn and Mark Rucker compiled and edited a 19th century review of baseball images for the Spring, 1984, edition of The National Pastime, published by the Society for American Baseball Research (SABR). 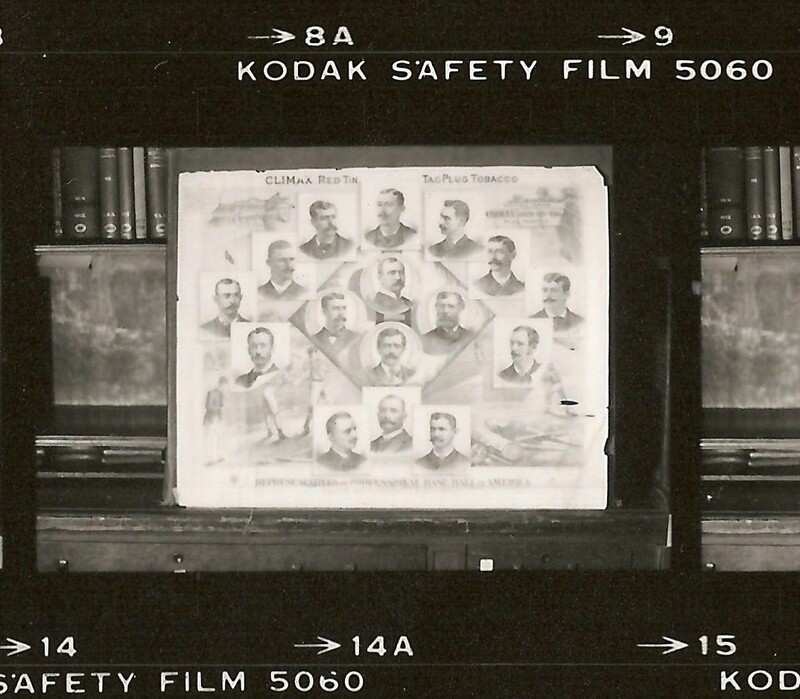 In the course of creating the publication, they conducted a photo shoot at the New York Public Library featuring items from the A. G. Spalding Baseball Collection, and one of the items they captured on a Kodak film contact sheet was, none other than, the ultra-rare 1867 Base Ball Polka. This copy of the rare 1867 "Baseball Polka" was captured on film in a 1983 SABR photo shoot at the NYPL. John Thorn, author of Baseball in the Garden of Eden and the newly appointed official historian of Major League Baseball, confirmed for us that his original contact sheet marked “NYPL 7″ was shot at the New York Public Library in 1983. In addition to the Base Ball Polka being documented as NYPL property in the 1983 SABR photo shoot, it was also documented in a 1975 book, The Illustrated Book of Baseball Folklore, written by Tristram Coffin. 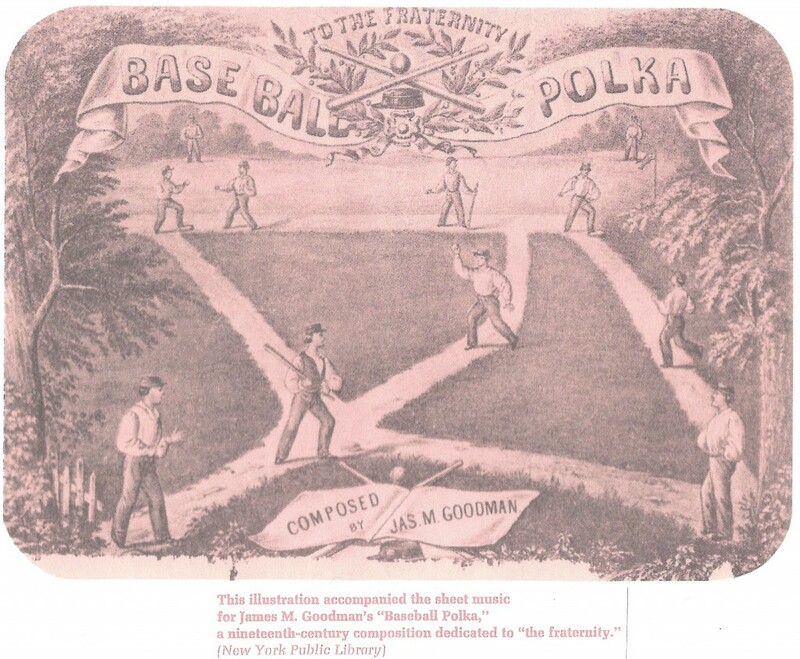 In the book, Coffin pictures a tinted black and white image of the Base Ball Polka, which he credited to the NYPL. The NYPL's missing copy of the "Base Ball Polka" was also documented as their property when it was illustrated in a 1975 book by Tristram Coffin. 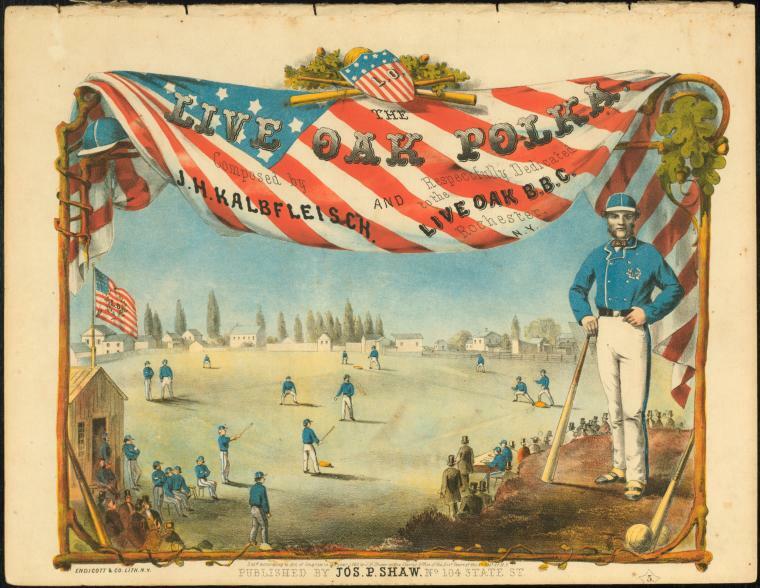 In order to verify that the NYPL’s Base Ball Polka was still in its possession, we searched the library’s online digital collection and main catalogue, but were unsuccessful. However, when we inquired through NYPL staff, they were able to locate a copy of the rare sheet music in the “Performing Arts Research Collection” at the Lincoln Center library branch. 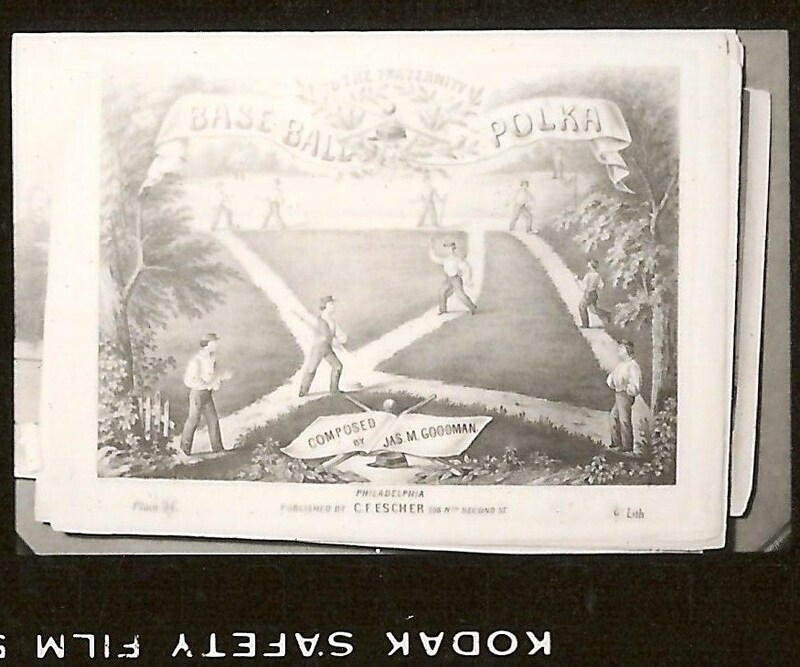 The copy of the "Base Ball Polka" currently in the NYPL collection appears to be a different than the copy photographed at the library in 1983. The copy currently at the NYPL features a distinctive circular brown stain or mark above the composers name, "Goodman." 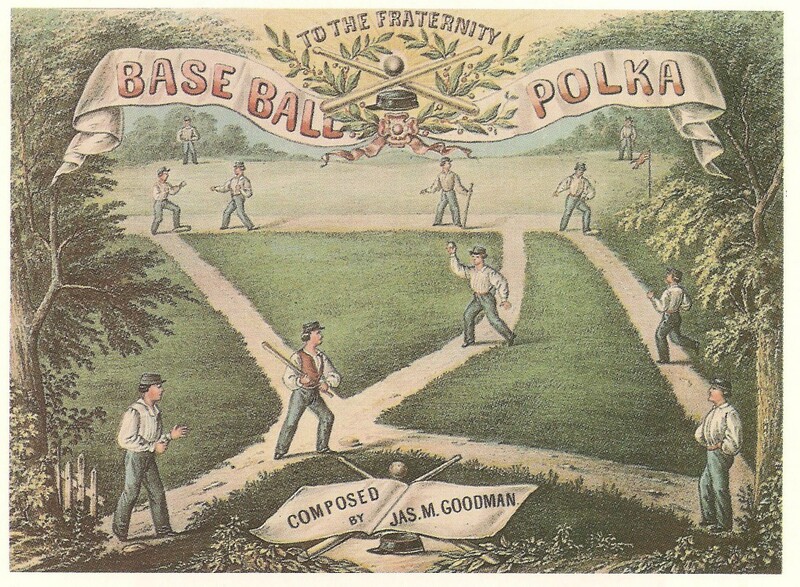 The NYPL copy of the "Base Ball Polka" from 1975 does not match the copy recently located in their collection, which features an oval stain above the name "Goodman.". The 1983 SABR photo shoot at the library was strong evidence that a second copy of the Base Ball Polka was part of its collection, so we reported our concerns to both the NYPL and FBI. Could it have been misplaced in the library after all these years, or had it been victimized by theft like many other baseball relics that have since vanished from the library and are part of an on-going Federal investigation? Considering the great rarity of the Base Ball Polka, could one of the copies in private hands belong to the NYPL? In 1979, the Steele’s co-founded one of the hobby’s most successful companies known as Perez-Steele Galleries. The Steele’s were also prominent collectors and in 1996, they donated their sizeable baseball sheet music collection to the National Baseball Hall of Fame in Cooperstown, New York. The Hall of Fame’s Steele Sheet Music Collection description states that the couple “started collecting baseball memorabilia in 1975,” and that their sheet music collection gave them a “well deserved national recognition among sports memorabilia collectors.” Their donated collection spans the years 1885 to 1992 and includes hundreds of pieces of sheet music. The Steele’s, however, did not donate their prized copy of the Baseball Polka to the Hall in 1996. Frank Steele passed away in 2000 and his widow, Peggy, consigned their copy of the Base Ball Polka to REA’s current 2011 sale. Additionally, the Steele’s copy being sold at auction appears to have two prominent stains located on the upper right border and in the left-field area of the illustration. Both of these imperfections suggest that the Steele copy is not the NYPL’s second copy of the Polka. With the current REA lot and the 1993 Christies offering believed to be the only known copies in private hands, (and the REA lot already ruled out as the missing relic) it was the task of our investigation to determine if the copy from the 1983 photo shoot had been wrongfully removed from the library. Likewise, it was equally important to expand the search within the NYPL collection to determine if this rarity was still located somewhere within the Fifth Avenue branch . As for any others in private hands, three long-time industry executives, Josh Evans, of Lelands, David Hunt, of Hunt Auctions, and Doug Allen, of Legendary Auctions, all confirmed that in their hobby careers they had never handled a copy of the elusive Base Ball Polka. When Christies sold this rare copy of the "Base Ball Polka" in 1993, they called it, "The most important piece of baseball sheet music ever to be offered at public auction." The sheet music sold for $9,200. If the Base Ball Polka was actually missing, it would likely become the focus of the on-going probe conducted by the Federal Bureau of Investigation into thefts from the NYPL’s Spalding Collection in the 1970s. Newly discovered evidence of items missing from the 1983 contact sheets would have to be added to an already sizable list of stolen artifacts. Missing from the NYPL collection are thousands of rare 19th century documents once owned by baseball pioneer Harry Wright; scrapbooks compiled by Albert Spalding; a score-book owned by Henry Chadwick; correspondence and score sheets from the Knickerbocker Base Ball Club; and a few hundred rare photographs and pamphlets catalogued in the 1922 inventory compiled by the library when the collection was donated by the widow of Hall of Famer Albert G. Spalding. Now, thanks to SABR and John Thorn, who held onto the original 1983 NYPL photo shoot contact sheets for several decades, items like the Base Ball Polka, which appear to have never showed up on the original NYPL inventories, were visually documented as having been part of its collection. In addition, the SABR contact sheets documented other baseball rarities including a 19th century advertising poster issued in 1884 by the Lorillard Company for Climax Tobacco. When we attempted to locate the poster, which is twenty-one inches by twenty-seven inches, it was also nowhere to be found in the Spalding Collection at NYPL’s Fifth Avenue branch. All we had was the 1983 image capturing the poster on the contact sheet that even showed NYPL library books on the shelves in the background. This rare 19th century Climax Tobacco advertising poster features the portraits of baseball pioneers A. G. Spalding and Harry Wright. The poster was documented on this contact sheet from a 1983 photo shoot at the NYPL. The Climax Tobacco poster featuring the portraits of baseball pioneers Harry Wright, A. G. Spalding and “Cap” Anson is also a rarity. Only a dozen or so are known to exist and its estimated value is between $10,000 to $20,000. A copy of the 1867 Base Ball Polka is estimated to be valued in the same price range. For comparison, in 1999, Barry Halper sold his copy of the less scarce Live Oak Polka for $25,300. In addition to the famous Spalding Collection, NYPL also houses the impressive Goulston and Swales Baseball Collections. 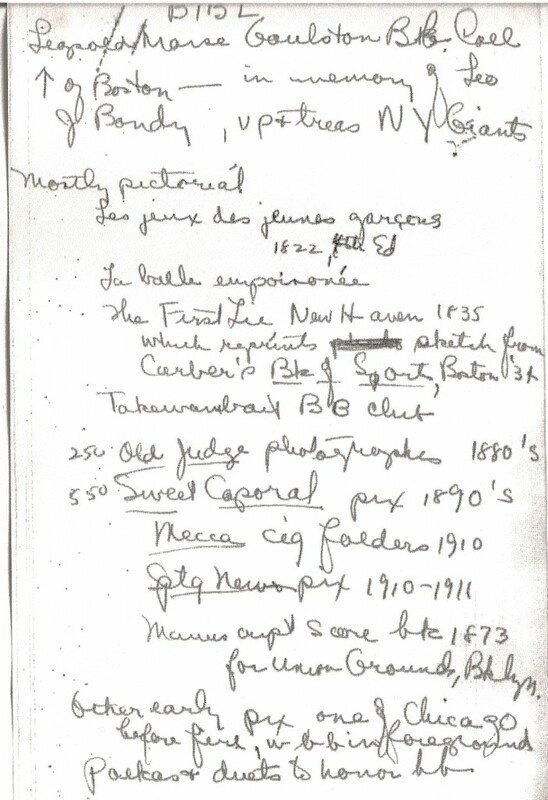 Historian John Thorn also shared with us a copy of his own notes from 1983 showing that he had examined both the Goulston and Swales holdings and confirmed that items in the 1983 shoot could have come from either of the lesser known collections. Armed with the information from Thorn’s notes we also re-examined the research notes taken at the NYPL in the 1950s by historian Dorothy Seymour Mills. Upon examination of those documents, we then discovered she had written a fairly detailed inventory of the Goulston Baseball Collection. She noted that the Goulston Collection included ”250 Old Judge photographs” on cabinet cards and “550 Sweet Caporal” tobacco cards (which included a copy of the famous T-206 Honus Wagner card), but she also observed that the collection included sheet music which she identified as: “Polkas and Duets to honor b.b.” Her original notes taken at NYPL are now part of Cornell University’s Seymour Papers Collection and were used to compile the bibliography for the groundbreaking book, Baseball: The Early Years (Oxford, 1960). With the knowledge that “Polkas” existed in the collection in the 1950s, we searched the current NYPL catologue of Goulston contents, and found that “box 9″ contained “sheet music” and that “box 7″ contained “large prints.” We informed NYPL staff and the FBI that the Base Ball Polka and the 1884 Climax Tobacco poster might be found in those boxes of the Goulston Collection. Soon after we informed the library and the FBI of our discovery it was confirmed that both items were, in fact, in those same boxes. Not only did the NYPL have one copy of the Base Ball Polka, the recent research conducted to locate the items in the 1983 photo shoot confirmed that they actually have two copies of the rare sheet music. The NYPL examples now appear to be two of only seven copies known to exist. So, the FBI can now cross the Base Ball Polka off of their list of potential missing items from the NYPL collection. Their probe into the library thefts kicked off in July of 2009 when documents stolen from the library appeared for sale at Major League Baseball’s All-Star Game auction in St. Louis. Sources indicate that they have recently stepped up their recovery efforts, but the New York office of the FBI has not yet released any details of recoveries made since their investigation commenced. 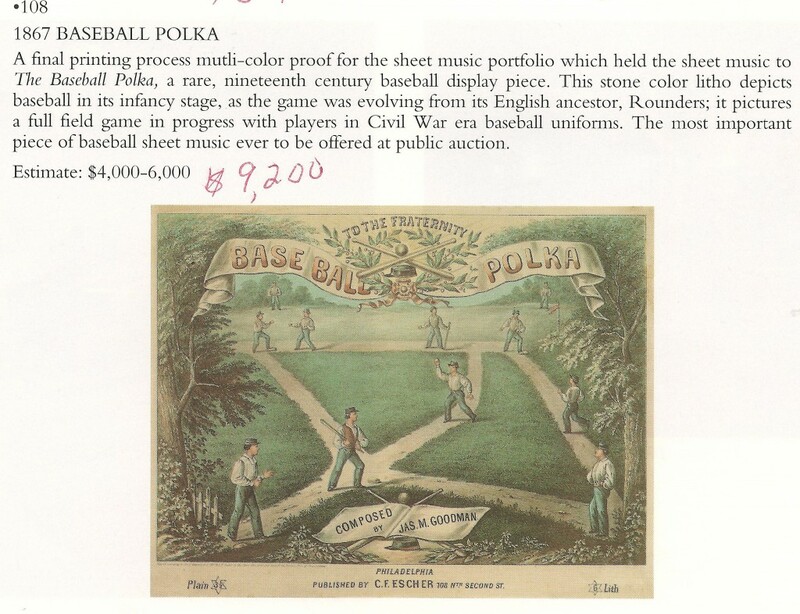 The Johns Hopkins copy of the "Base Ball Polka" (above) was pictured in the 1992 book, "The Old Ball Game" by Mark Alvarez. At the least, this is a fascinating piece of history. It is totally amazing what is going on out there in the memorabilia market, but then again,look how many of the likes of Halper there are, that have been caught ??? Very nice site and quite a story!